Super 8 is Probably Not What You Expected. Is That a Good Thing? This poster probably would have clued me in. 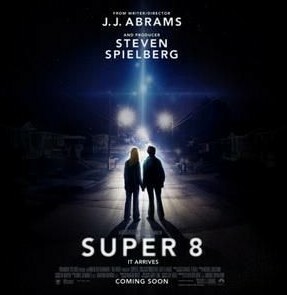 Most of the people I’ve talked to call Super 8 call “that new Spielberg movie.” They’re half right, or perhaps less. It was produced by Stephen Spielberg, but written and directed by J.J. Abrams (Lost, Alias, the most recent Star Trek). It would not surprise me, though, to find out that Spielberg had a huge hand in the creative process, because it has that Spielberg feel to it. Here thar be spoilers, so go no further if you don’t want to know much more about the movie. Like Spielberg, J.J. Abrams can also create non-syrupy sweetness in a movie ostensibly about something else. George Kirk’s brief appearance in Star Trek evokes more genuine sentiment than the entirety of Terminator Salvation. While he is still relatively early in his career, Abrams may be just as masterful a storyteller as Spielberg is/was at the top of his game. Several scenes in Super 8 use subtle dialogue and visual cues that refer to earlier parts of the movie to make a particular point, without beating the viewer over the head or even revisiting the issue to make sure viewers “got it.” We don’t see more than a half-second glimpse of the alien until three-quarters of the way through, and we don’t see it full on until the end. This confidence that Abrams, and one presumes Spielberg, have in their audience elevates what could have been a run-of-the-mill flick to something a bit more special. To be honest, though, my expectations prevented me from enjoying this movie as much as I could have. Even with a passel of child actors, I expected Super 8 to be a more of a straight-up horror movie. Though it may not be either’s favorite subject matter, both Abrams (Cloverfield) and Spielberg (War of the Worlds) are capable of mass carnage on screen, so I thought that’s what I thought I might be getting, perhaps with a nifty twist. And there certainly is a twist, one of the Spielbergian last-half-of-A.I. “Blue Fairy” variety. I won’t reveal the details, but it was too After School Special-y for me, even though I knew what was coming given the events and tone of the rest of the movie. All in all, Super 8 will probably surprise you either for what it is or what it isn’t. You won’t be blown away, but it’s not a bad way to spend a couple hours and a few dollars. ← 9 Songs for Summer 2011: Kreayshawn, tUnE-yArDs, the Weeknd, Bugle, Toro Y Moi, et al. For all its obvious touches of Spielbergia, Super 8 feels a whole lot like The Iron Giant meets Stand By Me. In a good way. Good Review! Whatever, dude. This movie was great. I don’t know why you expected a Wild Bunch-style bloodbath when it has a PG-13 rating. Part of the expectation issue was my fault, but part wasn’t: most trailers and posters for Super 8, especially the early ones: dark, grainy, ominous, etc. Leaks and teasers? I actually heard “super-scary” and “mind-blowing.” (It was neither.) Again, I’m not saying it was a bad movie, because it wasn’t. It simply wasn’t what I expected. By the way: Cloverfield: PG-13. War of the Worlds: PG-13. I wouldn’t describe anything you actually see in those movies as “carnage.” That word, for me anyway, evokes images of severed limbs raining down from the sky. Maybe we just saw different ads, but none of the ones that I saw ever promised me Cloverfield levels of mass destruction. I was expecting E.T.-but-with-a-meaner-alien, which is exactly what I got.